Starting with “why” is a principle tenet of our approach to brand strategy at Ignite XDS, because it just makes sense. Think about it. Does someone choose your shoe brand over another because they know all of the science behind how you make a better shoe? Or do they choose your shoe brand because of the way you make them feel? This is exactly what Nike does. They say "Just Do It." They portray both great athletes and average people experiencing the challenge and championing their goals...while wearing Nike shoes. They tell a story rather than list off facts. Through strong, compelling storytelling that appeals to emotion, they present their “why” that convinces you to spend $100+ on a pair of shoes. People are buying the story, not the object. So what do you do if you don't have Nike's marketing budget? Don't underestimate the power of words. In today’s connected culture, investing in your brand and persona through tools like your website and marketing materials, is crucial to the success of of your organization. Ask yourself, do your current marketing efforts tell your brand story through copy that connects to the audience on a personal level OR do your current marketing materials simply list product facts? It's this factor that will give you a significant advantage over your competitors. Many studies have found that 90% of decisions are made based on emotion, and there’s a reason for that: we do what feels right, and most importantly what’s right for us. That "gut feeling" is a real thing, and we base decisions on that feeling. In fact, we often spend more time finding facts to justify that gut feeling rather than only basing our decisions only the facts themselves. A few years ago, noted neurologist Antonio Damasio found that while studying people who suffered damage to the emotional epicenters of their brains, all had a peculiar commonality: they couldn’t make decisions. They could explain what they should be doing in logical terms (FACTS), but even simple decisions – such as what to eat – were extremely difficult. The struggle to make decisions was due to the damage to the emotional part of their brain. In copywriting, it is critical that you appeal to your audience’s emotions rather than bog them down with cold facts. Those can come later, but only after you’ve hooked them with copy and storytelling that resonates with them on an emotional, personal level. Put yourself in their shoes. Why do you do any of the things you do? To either benefit yourself and/or those you care about. The key to doing this is the power of words – saying a lot while saying a little. You must consider the attention span of your audience. The average person spends about 24 hours a week online, and the average website conversion rate (the percentage of users who take the desired action) is 2.35% for landing pages. This shows that while most people spend a ton of time surfing the internet, they’re doing it incredibly fast. Exactly how fast? They're making decisions about the websites they are visiting within three seconds. When it comes to the average user, that’s generally how long you’ve got to grab their attention. It's in this moment that your brand, persona, and strong, compelling copy will play their biggest role: getting your audience to stay. It can be detrimental to over load your audience with details before they’ve even decided that they want anything to do with you. It's during these first moments that flash by in the blink of an eye, that the user is going to decide if they want to stick around. When writing those first few words of copy, put yourself in the shoes of your user and ask, what's in it for them? Like it or not, there are tons of other brands who probably do what you do. Show your audience what makes you different. Once you’ve successfully captured your audience’s attention with short but compelling homepage copy that conveys your brand persona, now you can elaborate with longer form content that needs to answer “why” your brand does what it does, which will in turn answer “why” the user should buy your product or employ your services. We've established that straight details are ultimately boring, so you’ll disguise them with storytelling. Every brand has a story, and one of the best ways to tell your story is to make yourself relatable to your audience. People are drawn to familiarity, so it’s just as important to know who you’re writing for as much as it is to know what you do and why you do it. Who are the target personas that you are trying to reach, and what do they want? Through the language used, as well as appealing to the desires of your audience, you can create copy that appeals to the user's subconscious and impacts their decision making on an emotional level. The secret is to keep their desires the priority. When they see themselves in you, or when it’s made clear that you share their ambitions; that’s when they care. And when they care, they buy what you’re selling. 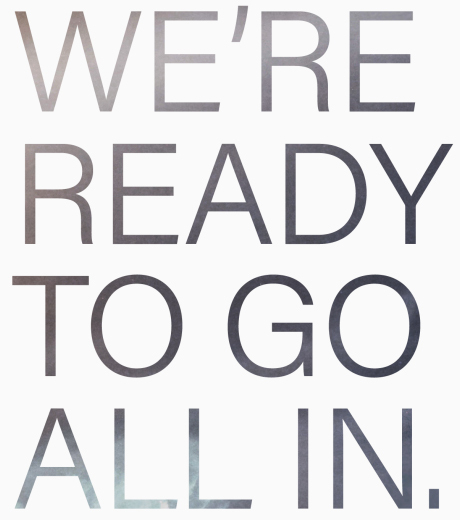 Are you ready to go all in? Fill out the form below and we'll contact you shortly.